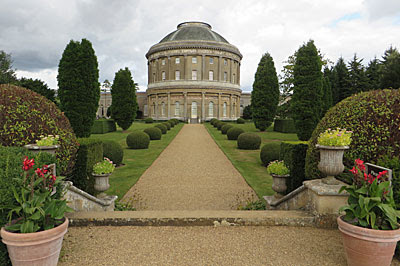 Ickworth's a most unusual building. The central portion looks like it's landed from outer space, a double decker monster with a giant rocket booster on top landed unexpectedly in the heart of the Suffolk countryside. In truth it's an Italianate rotunda built around the turn of the 18th century for the Marquesses of Bristol, a dynasty renowned for hell-raising behaviour right up to the present day. Two single storey wings curve off to each side, each deceptively thin, more for show than practical use. The family lived at the end of the east wing, and the central rotunda was usually used only for guests, especially when shooting parties descended and needed a luxurious base. Today the National Trust owns the lot, leasing the east wing as a posh hotel and much of the west wing as a conference centre, leaving visitors the glorious centre to explore. Entry is via the servants' quarters, the entire downstairs slice, expertly dressed up with as it might have been one day in 1935. Even the scratchy toilet paper looks authentic, but it's a bit cold down there in places, even in August. Climb the staircase to enter a broad high opulent entrance hall, and a trio of grand state rooms dressed with drapes, chandeliers and accumulated works of art. The upper level houses bedrooms for guests and is on an equally lofty scale, with daylight streaming down through a void in the hollow roof. As usual the Trust's volunteers are on hand to tell you more, even more politely helpful here than usual, and there's a tasteful cafe (and second hand book stall) tucked away in the west wing. Outside is the first Italianate Garden in Britain. It's more topiary-based than floral, with a secret "stumpery" hidden behind hedges at the rear where decades of spiky tree roots have been decoratively positioned to create a fairy tale vibe. Assuming you're up for a walk the estate stretches for miles, down past the parish church, walled garden, ornamental river and beyond. Various tracks are signposted, although the prescribed times for completing them are ludicrous as if calculated for joggers rather than genteel NT patrons. 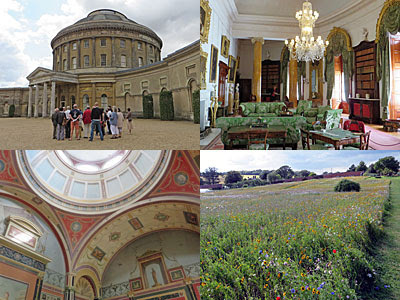 The park and gardens are open all year, with the house open most days of the week from Easter to the end of October. The full package isn't cheap, but if you're ever in the Bury St Edmunds area... yeah right.